Same-day delivery for most orders placed by noon, with expedite options if placed later! Call to order a gift of flowers for someone you love. Or treat yourself! Open occasional Sundays befitting special floral holidays such as Mother's Day, Valentines, Passover and Rosh Hashannah. Away each Canadian long-holiday weekend (Saturday, Sunday and Monday (unless we're booked for a wedding or event). And closed for winter holiday between December 24 and January 4. If you would like information or to discuss flowers for any occasion, whether a solo gift or grand celebration, we are happy to hear from you. Or, send us feedback. Drop in to visit and hand-select your blooms at our floral studio at 2847 Dufferin Street (at Glencairn), Toronto, Ontario, M6B 3S4. Arrangements shown are representative. Flowers are subject to seasonal availability and market freshness! For example, we shy away from tulips in summer, even though they may at times be imported from long distances or other hemispheres. And peonies, they're a late spring thing! 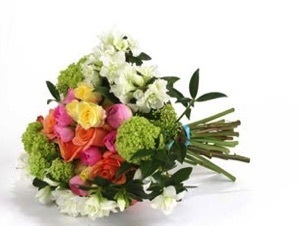 We will do our best to provide your glorious flowers in the hues you choose, regardless of the season. To achieve this goal, we may substitute blooms different from your initial preferences or the photo you choose.